Click here for a full-size image of the cover! There are many strange features to The Black Crusade, but ignore them! Enjoy the novel as a novel! Don't worry about inserted diagrams, summarized chapters or the attempted preachings of Martin Smythe. Don't worry about the conspiracy of vileness--it can't touch us in the real world! The story takes place in 1894, and tells of a Hungarian bank clerk, Basil Smorta, who falls hopelessly in lust with Volusia, aka 'the Australian Songbird'. He follows her across Europe in company with a group of Fundamental Darwinists led by Lord Malicide Sain. They pursue their 'Black Crusade' at first by cart and carriage, then in Ingel Brankel's Mobilator. One bizarre and gruesome adventure follows another. The Ordeal of the Five Senses in the monks' lavabo, the excruciating apotheosis of Brother Dragorian, the doting love of the Love-Vampires, the bomb-throwing police force of Orblast, the sleep-tranced villagers in Morbol Villica and the sarcophagus of the Great One, the legendary marquis himself. Lurid, grotesque, black, bizarre, tasteless, gross and very very funny! 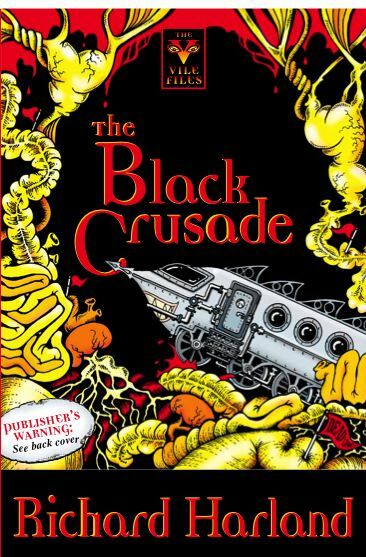 There's never been a novel like The Black Crusade! Why do Horace Cull's little loaves of bread have bones in them? What is homicidal sexual mania and does Volusia really suffer from it? Why do the Black Crusaders worship the evolutionary theory of the Holy Darwin? Why does Invel Brankels new bride call him a flaccid flopper? How do the Black Crusaders recover a key from Brother Dragorian's bowels? Why does Basil Smorta need to extend his manhood beyond all human possibility? What's the connection between the Marquis of Morbol Villica and the Vicar of Morbing Vyle? And how can YOU contribute to www.vilewatch.com and help in the war against universal vileness? No, whoa, that last bit shouldn't have slipped in. It comes from the book's back cover--but Chimaera Publications shouldn't have let it slip in there either. Forget www.vilewatch.com , erase the followers of Martin Smythe from your mind. There is NOTHING TO WORRY ABOUT! The Black Crusade is not some messianic message to the followers of an eccentric cult. It is a simple, lurid phantasmagoria shot through with horror, laughter, grotesquerie and helpful footnotes. Now available in all good bookshops for only $19.95. If you need to order, the distributor is Dennis Jones & Associates, and the ISBN is 0-9752143-0-6. You can also buy direct from Chimaera Publications by sending cheque or money order for $22.95 to Chimaera Publications at PO Box 2164, Mt Waverley, VIC 3149 (includes postage and packaging). Check out the map of the Crusaders' journey! Sample some extracts from the book!